Valerie Francisco-Menchavez is an Assistant Professor in the Department of Sociology and Sexuality Studies at San Francisco State University in California. She received her Ph.D. from the Department of Sociology at City University of New York, The Graduate Center. 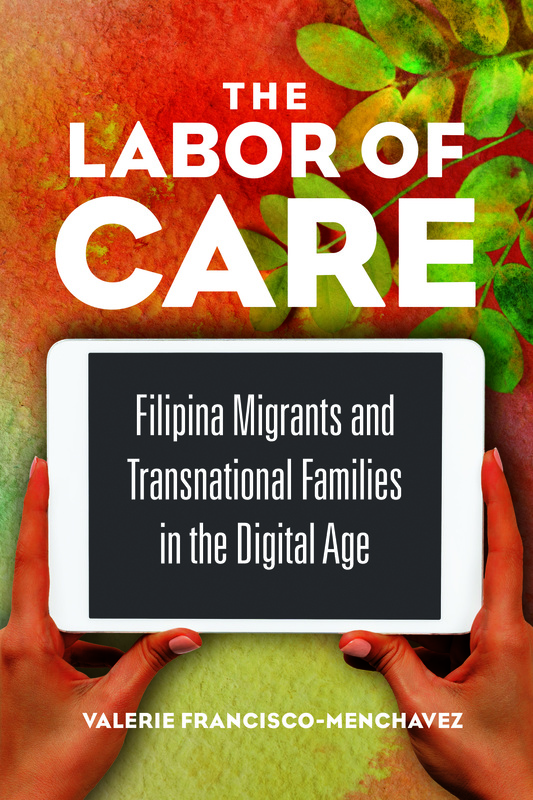 Her book entitled, The Labor of Care: Filipina Migrants Transnational Families in the Global Digital Age (University of Illinois Press, 2018), explores the dynamics of gender and technology of care work in Filipino transnational families in the Philippines and the U.S. Through an examination of neoliberal immigration policies and market forces, Francisco contextualizes the shifts in the long-standing transnational family formation in the Philippines. Dr. Francisco’s research program includes a transnational study of Filipino migrant mothers in New York City and their families left behind in Manila and participatory action research with Filipino immigrants working as caregivers in the U.S. Her academic work has been published in journals such as Critical Sociology, Working USA, The Philippine Sociological Review, Action Research and International Review of Qualitative Research. Dr. Francisco also writes on the transnational activism that emerges from the social conditions of migration, separation and migrant labor. Francisco’s research is informed by the transnational activism of GABRIELA, an alliance of progressive Filipino women’s organizations in the Philippines and internationally, and MIGRANTE International, an international alliance of Filipino migrant workers. These networks of diasporic and transnational solidarity between Filipino migrant communities and the national democratic movement in the Philippines has helped shape her critical perspective on neoliberalism. To this end, Francisco has engaged in participatory action research and community-based methodologies in all of her research projects where Filipino and Filipina migrants’ experiences are centered as experts. Currently, she is conducting a community-based research project about Filipino caregivers’s mental and health outcomes while working in the understudied industry of caregiving to the elderly. More importantly, this research project prioritizes the development of leadership and organizing capacity in the Filipino community in the Bay Area through migrant workers organization, Migrante. As an educator, Dr. Francisco continues to develop her pedagogy to engage students’ ideas and spirit in learning how to analyze the world sociology. She does this by preparing her courses with a global perspective and preparing a range of learning activities in and outside of her classroom. Dr. Francisco is committed to students’ ability to think critically about the complex times we live in and in their potential to change the world. Dr. Francisco has been awarded the Best Article Award for “Save Mary Jane Veloso: Building Solidarity and GlobalMigrant Activism in the Filipino Labor Diaspora” in 2018 by the Filipino section in the Association of Asian American Studies. In the past, she was awarded the 2015 Pacific Sociological Association’s Distinguished Contribution to Sociological Praxis Award and has been named one of the ten national finalists for the 2014 Lynton Award Scholarship of Engagement for Early Scholars by the New England Resource Center for Higher Education (NERCHE). She was also the recipient of the Davis-Putter Scholarship and has received a University of Michigan NCID Diversity Scholar citation. Dr. Francisco has worked as a post-doctoral fellow with the Public Science Project, served as the Dissertation Writing Fellow in the Department of Sociology at the University of San Francisco and a graduate fellow for the Center for Place, Culture, and Politics at CUNY, The Graduate Center. Raul, I’m waiting for YOUR comeback! u knoes howz to getz downz lolz! helladope.. my fave part is the comeback=) come on!